Ryanair has retracted a claim that it had cut emissions of carbon dioxide by half over the past five years. The airline's chief executive, Michael O'Leary, has admitted that his statement was "an error". His comments followed an investigation by BBC Newsnight, which demonstrated that the claim could not be true. Ryanair had initially threatened the programme with legal action if it aired the report. Ryanair describes itself as Europe's greenest, cleanest airline. The airline has now conceded its fuel use has increased eight-fold between 1998 and 2006. Experts says this means Ryanair emissions of carbon dioxide will have also risen eight-fold over the same period. Jeff Gazzard of pressure group Green Skies Alliance estimates that last year Ryanair planes pumped 2.9 million tonnes of carbon dioxide into the air. He said that Ryanair had been "caught out", adding that "this must be the first example of Michael O'Leary admitting he is wrong". But Mr Gazzard also had some praise for the company. "If this is a move to honest reporting of company emissions, then credit to Mr O'Leary for owning up." 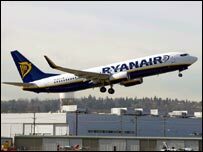 Mr O'Leary originally made the claim that Ryanair had cut carbon dioxide emissions by half at a press conference on 10 January 2007. When challenged to provide the figure to back up these claims, Ryanair said it did not have the information. A BBC enquiry demonstrated that the airline had originally planned to make a different claim, that it had cut carbon dioxide emissions by half, per passenger. The words "per passenger" were subsequently removed by the company.